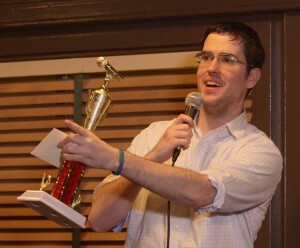 Steve Clark was named “Best Storyteller in Philadelphia” by First Person Arts StorySlam in both 2013 and 2014, and won the February 2015 Scranton StorySlam. Steve is a 6th grade teacher, storyteller, and poet. He is the coach of Cristo Rey High School’s Slam Poetry team. According to his Speak Out: Slammageddon bio, “He carries his favorite book, Infinite Jest, with him just about everywhere he goes. He secretly hopes you are impressed this is his favorite book. His celebrity doppelganger is Bob Saget. He is awkward. He is tall.” A graduate of the University of Scranton, Steve is looking forward to spending time with us back in his old stomping grounds. Steve will perform an original piece, “The Awkward Life of Steve Clark,” at the Scranton Fringe Festival. This show is a collection of first person narratives (like from The Moth, This American Life, etc.) from Steve Clark – usually hilarious, always awkward.